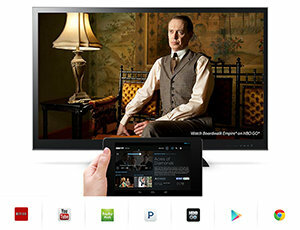 With Chromecast, you can easily enjoy your favorite online content on your HDTV—movies, TV shows, videos, music, photos, websites, and more from HBO GO, Netflix, YouTube, Hulu Plus, Pandora, Google Play Movies & TV, Google Play Music, and Chrome. Learn how. Chromecast works with devices you already own, including Android tablets and smartphones, iPhones, iPads, and Chrome for Mac and Windows. Browse for what to watch, control playback, and adjust volume using your smartphone, tablet, or laptop. You won't have to learn anything new. Casting is currently supported from HBO GO, Netflix, Hulu Plus, Pandora, YouTube, Google Play Movies & TV and Google Play Music. All other apps, including Amazon Instant Video, and HBO Go, are not currently supported. Almost every video you can view in your Chrome browser should work, including Flash videos. Video formats that require other plugins, such as Silverlight and Quicktime, may not work. Tab projection for Amazon Prime Streaming and Amazon Instant Video will not work when using Silverlight plugin for streaming. Kindle, Windows Phone and Microsoft Surface RT are currently not supported. Kindle can cast from Netflix but does not currently support YouTube or Google Play. Microsoft Surface Pro should work in non-metro mode. Chromecast is compatible with WiFi-enabled Android 2.3+ smartphones and tablets; iOS 6.0+ iPhones, iPads, and iPods; Chrome for Mac and Chrome for Windows; and Chromebook Pixel. 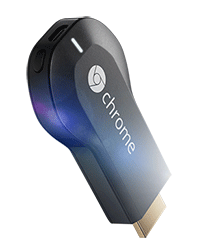 Currently Chromecast does not support casting a Chrome tab from smartphones or tablets. Chromecast is only supported in the United States.